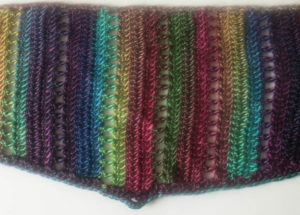 Drape this shawlette over your shoulders or wrap it around the neck as a scarf. And not only will it keep you warm, but the pretty colors will also brighten up any outfit. You will need a medium worsted weight yarn and an H crochet hook.